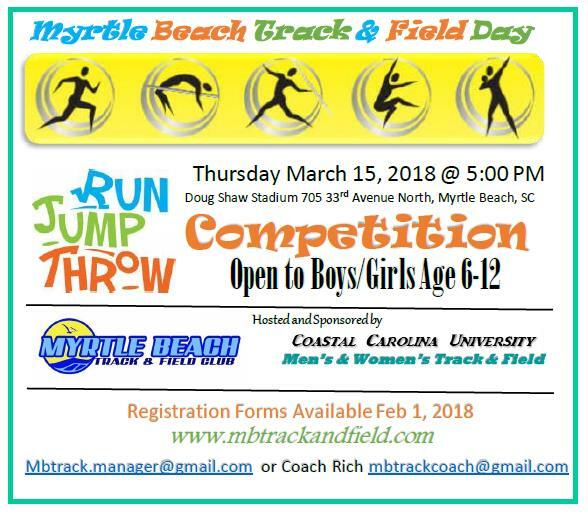 Myrtle Beach Track and Field Club hosts Track & Field Day for Kids on Thursday, March 15, at Doug Shaw Memorial Stadium, 705 33rd Avenue North. The free event is for kids, ages six to 12 years of age, and registration is at 5:00 p.m. Kids participate in Run, Jump, Throw events that include the High Jump, Mini-Javelin Throw, Long Jump, Hurdles and Run/Relay alongside Coastal Carolina University Track Athletes! The competition is 5:30 to 6:15 p.m. To pre-register via form, visit mbtrackandfield.com or email Melissa at mbtrack.manager@gmail.com. For more general information, call 843-353-0220.